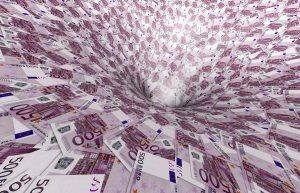 The European Central Bank has acknowledged that the euro is being sucked into a deflationary vortex. It has responded with, in effect, a massive devaluation. Eurozone citizens have responded by converting their unbacked, make-believe, soon-to-be-worth-a-lot-less paper money into something tangible. They’re bidding up gold. The euro price of gold has gone parabolic. This sudden awakening is the standard pattern for a currency crisis, mainly because it takes a long time for most people to figure out their government is clueless and/or lying. But once they do figure it out, they act quickly. Europe’s gold chart isn’t as dramatic as Russia’s, because Europe doesn’t depend on oil exports and the euro, while dropping versus the dollar, isn’t yet in free-fall. But with another trillion euros due to hit the market in the coming year, and a series of currency union-threatening political crises in the pipeline, the flight to safety could become a stampede. Europe and Russia aren’t the only countries with incipient currency crises. Gold in Canadian dollars is also climbing at a breakneck pace. This article illustrates the nature of gold. It behaves as it does in crises because it is sound money that can’t be created in infinite quantities by panicked central banks as can euros, Canadian dollars and all other fiat currencies. Charts included with the article illustrate what happens when this difference starts to matter. The next stage will begin when enough local currencies blow up to make people realize that the problem isn’t with specific governments or national forms of money, but with the idea of fiat currency itself. When that happens, the global gold chart will look like Europe’s—but with more zeros.